The Waterland Marathon has two race distances a 14 kilometer race and a 24 kilometer race. As of 2018 (the 46th edition) the senior ladies race along with the senior men in the 24km distance. Since the 47th edition in 2019 the junior men will also start the 24 kilometer race. 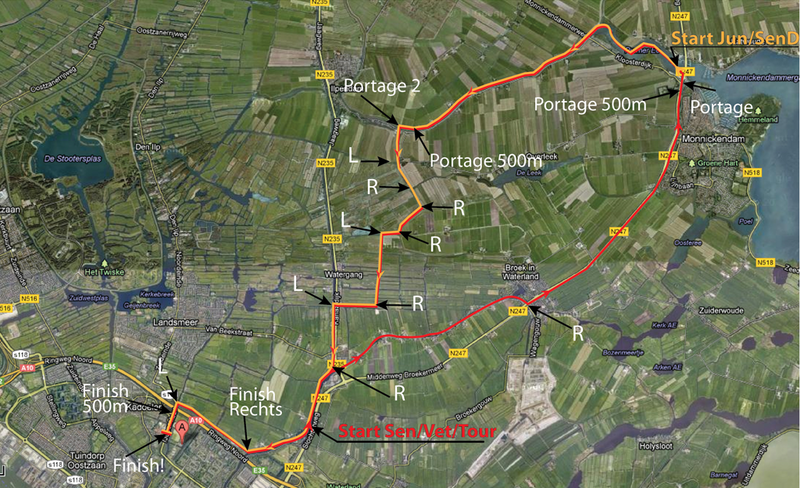 The 24 km race has two portages , one after 7 kilometers in the town of Monnickendam and a second portage close to the town of Ilpendam. The second portage at Ilpendam is unique in this world because the Dutch wetlands requires participants to land their boats on to the shore before continuing through the marshy meadow. The route then passes through the shallow waters of a nature area before heading into a deeper canal. The race has very different types of water for all racing classes, from deep to shallow polders. These different types of water demands various tactics. The finish for all racing classes will takes place in Amsterdam in the vicinity of the Viking Canoe boathouse. For a better impression of the race check the video and map on this page. Supporters and visitors are able to follow the race by bike or car for most of the course.